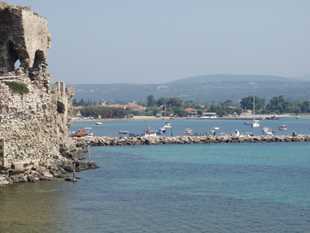 Methoni is 50 miles down the Peloponnese coast, and well worth the stop. 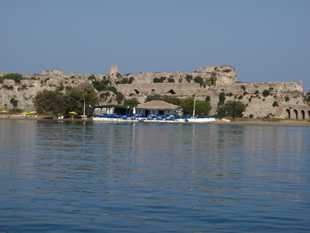 It is in a bay that is tucked away behind the hills and a Venetian fort. 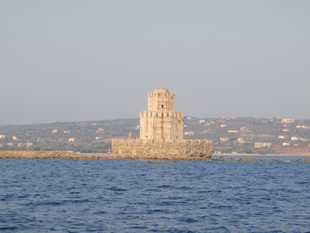 From the seaward side, the first thing you see is the Turkish tower at the end of the fort wall that runs along the coastline. As you round the tower, the bay comes into view. 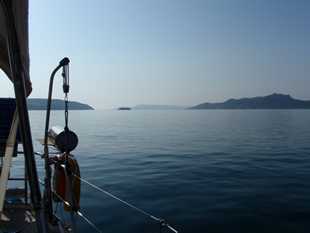 No marina here, just a beautiful anchorage. The first thing we did after anchoring was to go for a swim off the back of the boat- yes, Lee, for the first time this trip! The water was beautifully clear and very refreshing after a hot sail. Now we were really glad we had finally tracked down someone to fix the outboard, because that evening we took the rib across to the beach, and had dinner in a beach taverna. The next day was spent exploring the town (which didn't take long! ), buying some fresh stores, chilling out and swimming. We found the supermarket by playing our usual game of 'spot the people carrying supermarket carrier bags'. This consists of walking in the direction from which these people have come in the hope they haven't made too many other stops since leaving the supermarket. It usually works, and didn't let us down this time either. We dined on board on barbecued chicken and salad, and then spent the evening relaxing with a bottle of wine and the view. Excellent.